The Marvel Super Heroes is an American animated television series starring five comic-book superheroes from Marvel Comics. The first TV series based on Marvel characters, it debuted in syndication on U.S. television in 1966. The series, produced in color, had extremely limited animation produced by xerography, consisting of photocopied images taken directly from the comics and manipulated to minimize the need for animation production. The cartoons were presented as a series of static comic-strip panel images; generally the only movement involved the lips when a character spoke, the eyes, and the occasional arm or leg, or a fully animated black silhouette. The series used the original stories largely in their entirety, showcasing Jack Kirby, Steve Ditko and Don Heck art, among others, from the period fans and historians call the Silver Age of comic books. Stan Lee, Marvel's editor and art director at the time, said in 2004 that he believed publisher Martin Goodman negotiated the deal with Grantray-Lawrence and that Lawrence chose the characters to be used. Lawrence rented Lee and his wife a penthouse apartment at 30 East 60th Street, near Madison Avenue, for Lee's use while he worked on the series. (Lee lived in Hewlett Harbor, New York, on Long Island, at the time.) Lee recalled, "I really don't remember any reaction from the Marvel artists involved. I wish I could claim to have written the [theme song] lyrics, because I think they're brilliant, but alas, I didn't". The songs were written by Jacques Urbont. In the meantime, Grantray-Lawrence subcontracted production of The Mighty Thor segments to Paramount Cartoon Studios (the animation division of Paramount Pictures, formerly known as Famous Studios), headed at that time by Fleischer Studios veteran Shamus Culhane. Marvel announced the series in the "Marvel Bullpen Bulletins" of the November 1966 issues, stating in that monthly fan page's hyperbolic style that, "It won't be long before our swingin' super-heroes [sic] make their star-studded debut on TV, appearing five nights a week — that's right, five — count 'em — five nights a week, for a half-hour each night. So you've just got time to make sure your set's in good working order — check your local paper for time and station — and prepare to have a ball!" For WNAC-TV in Boston, Arthur Pierce portrayed Captain America in live-action segments for the show. Actors portraying other characters, including Dr. Doom, Hulk, and Bucky, also appeared in live-action segments. The segments were scripted by Superman co-creator Jerry Siegel. The X-Men — The original lineup of the Angel, the Beast, Cyclops, Iceman, and Marvel Girl appeared in a Sub-Mariner episode, "Dr. Doom's Day / The Doomed Allegiance / Tug of Death". The story was an adaptation of Fantastic Four #6 (Sept. 1962), but since Grantray-Lawrence Animation did not own rights to the Fantastic Four, the producers substituted the X-Men — although referring to them instead as "Allies for Peace". However, the characters retained their original designs and individual names from the comics. The Avengers — Episode 8 of The Incredible Hulk was an adaptation of Avengers #2 (Nov. 1963), and co-starred Thor, Iron Man (with his early golden armor recolored to match the red-and-gold design featured in the Iron Man episodes), Giant-Man, the Wasp. The lineup beginning in Avengers #4 (March 1964), with Thor, Iron Man, Giant-Man, the Wasp and the newly installed Captain America, appears in several Captain America episodes, as does the later line-up from Avengers #16 with Hawkeye, Quicksilver, and the Scarlet Witch. Each episode consisted of three chapters. Episode 3: A Titan Rides the Train, The Horde of Humanoids, On the Rampage! Episode 7: If I Die, Let It Be With Honor; Fight On, For A World Is Watching; What Price Victory? Source: Marvel Comics house ads in Strange Tales #150 (Nov. 1966) and The Amazing Spider-Man #45 (Feb. 1967), each of which said the list was "incomplete at time of publication". WTTG / Channel 5 • Washington, D.C. 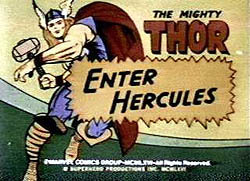 Segments of the series appear on at least two VHS home video releases, containing three videocassettes each: Marvel Superheroes: Triple Pack #1 (UPC #024543004127) and Marvel's Mightiest Heroes: Triple Pack #2. Fox Video released a version titled Marvel's Mightiest Super Heroes Gift Set (EAN #0024543004134). In 2003, Hulk segments giving his origin story appeared as an extra on the Buena Vista Home Entertainment DVD release of the 1996 animated television series The Incredible Hulk. In September 2004, Buena Vista Home Entertainment announced plans to release The Marvel Superheroes Show on June 28, 2005, as a five-DVD set titled The 60's Superheroes. By February 2005, however, the release was off the schedule. On May 21, 2007, the UK company Maximum Entertainment released four two-disc sets, for Region 2, each set containing 13 episodes of the Captain America, Iron Man, Sub-Mariner and Thor segments respectively, with each episode re-edited into continuous, half-hour segments. 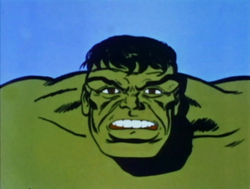 On August 25, 2008, the UK company Liberation Entertainment released a two-disc set of the Hulk segments, re-edited into 13 20-minute episodes..
^ Title per The Marvel Super Heroes. (Animated opening credits) YouTube. Archived from the original on October 26, 2013. Retrieved 2013-10-25. NOTE: The title is rendered inaccurately as "The Marvel Superheroes" at its entry on the Internet Movie Database and at TV.com. ^ Robert Lawrence interview, Jack Kirby Collector #41, Fall 2004, pp. 42-47. ^ "''The Marvel Superheroes'' Episode Guide". TV.com. Retrieved 2011-01-12. ^ Thomas, Roy; Sanderson, Peter (2007). The Marvel Vault: A Museum-in-a-Book with Rare Collectibles from the World of Marvel. Running Press. p. 101. ISBN 978-0762428441. In 1966, television production company Grantray-Lawrence produced a series of five half-hour semi-animated shows under the banner title Marvel Superheroes. Captain America, The Incredible Hulk, Iron Man, The Mighty Thor, and Sub-Mariner all made their television debuts. ^ McGovern, Adam (Fall 2004). "A Minute of Stan's Time" (41). (sidebar, Jack Kirby Collector: 47. ^ Jon Burlingame (2015-07-14). "The Marvel Super Heroes Songs: The Inside Story". The Film Music Society. Retrieved 2018-11-18. ^ Marvel Bullpen Bulletins: "Sensational Secrets and Incredible Inside Information Guilelessly Guaranteed to Avail You Naught! ", in Tales of Suspense #83 (Nov. 1966) and other Marvel comics that month. ^ Butler, Kevin S. (n.d.). "New York City Kid Show Roundup: Marvel Superheroes [sic]". TVParty.com. Archived from the original on September 4, 2001. ^ Hofius, Jason; George Khoury (2010). Age of TV Heroes: The Live-Action Adventures of Your Favorite Comic Book Characters. TwoMorrows Publishing. ISBN 1-60549-010-5. ^ "'Marvel's Mightiest Heroes: Triple Pack #2'". Rotten Tomatoes. Retrieved 2011-01-12. ^ Powell, James W. (June 17, 2003). "'The Incredible Hulk' (Animated Series)". (review) DVDTalk.com. Retrieved 2011-01-12. ^ Lambert, David (September 24, 2004). "The Marvel Superheroes - Capt. America! Hulk! Thor! Iron Man! Sub-Mariner!". TVShowsonDVD.com. Archived from the original on February 8, 2006. Retrieved 2011-01-12. ^ Lambert, David (February 1, 2005). "The Marvel Superheroes - Studio Says 'Superheroes' are Off the Schedule". TVShowsonDVD.com. Archived from the original on August 18, 2007. Retrieved 2011-01-12. ^ "Jon T" (pseudonym) (July 23, 2007). "'The Marvel Super Heroes': Classic Comics in Suspended Animation". Toon Zone. Archived from the original on February 11, 2009. Retrieved 2011-01-12.